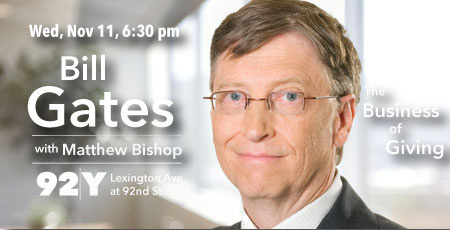 92nd Street Y Talks presents Bill Gates in a rare appearance this Wednesday at 6:30 pm. Gates, Co-Chair and Trustee of the Bill and Melinda Gates Foundation, and Chairman of Microsoft, will discuss his pioneering career in business and philanthropy with The Economist's Matthew Bishop on stage at 92Y; this special evening includes a Q&A with the audience. MUG readers have access to specially discounted tickets – use code MUG when you click www.92Y.org/Talks or call 212.415.5500 to save 25%!